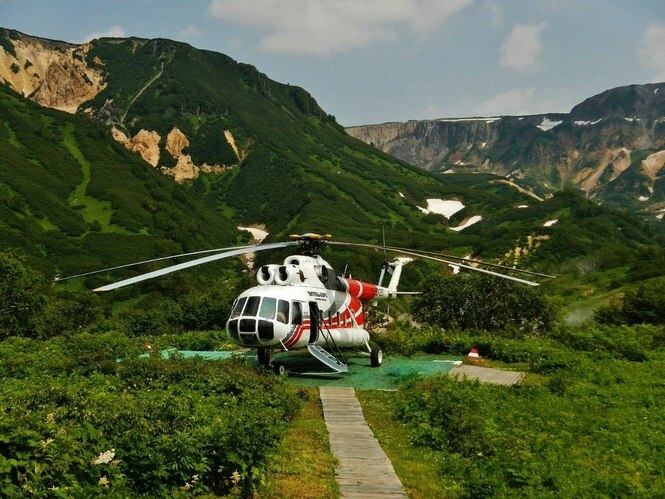 "All Kamchatka for 12 days"
Transfer from airport to Petropavlosvsk-Kamchatskiy. City tour with visiting a museum about explosion of volcanoes. Day of relax after long trip in hot spring in Paratunka. Comfortable accomodation in a room for 1-2 person. Day 2. 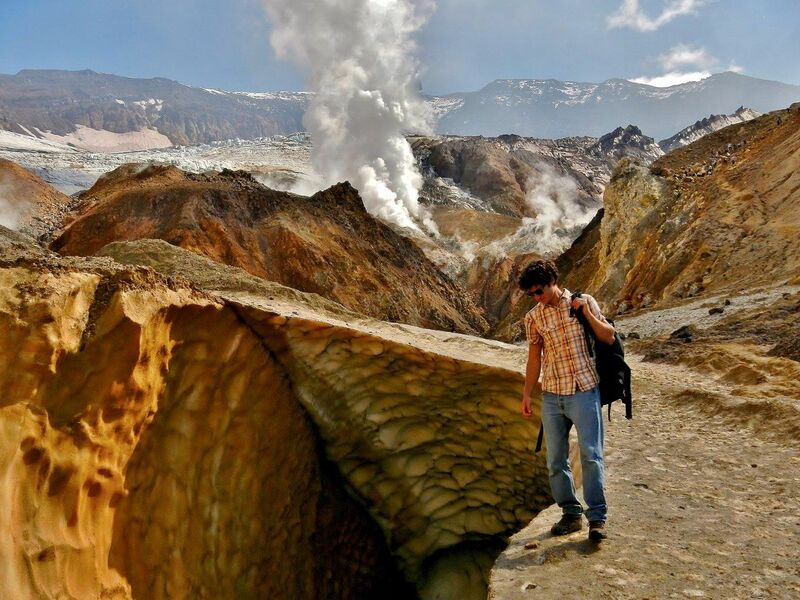 Discover active volcano Goreliy. Day begining from a little off-road trip from city to volcanoes area. We will arrive at land of active volcanoes - Goreliy and Mutnovskiy. Hiking to top of volcano Goreliy. Goreliy is alive volcano!!!  In ancient times, it exploded with lava flows and magmatic gases, sweeping away everything in its path. Often through powerful lava flows, powerful jets of water vapor pierced, the traces of which were slag cones - have remained here to this day. The volcano is still active. The last time he manifested himself in 2010, when fountains of gas and steam broke out from under the ground. When we will hike to top of volcano we can feel like groung around alive and breath. Today we will sleep at wild house between active volcanoes. Day 3. Trekking to crater of active volcano and relax in wild hot spring. 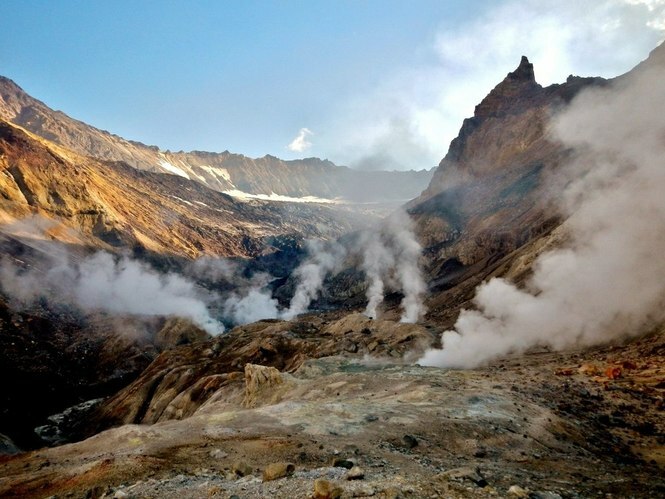 In the begining of day we will trekking and discover 4 craters of active volcano Mutnovskiy. Each craters will give for us unbelievable picture. Truly, the amazing beauty of the rocks, covered by snowfields and glaciers, with rising pairs of clouds rising up, will not leave us indifferent! After don't think thats amazing gifts of nature is finish. It's not true! Canyon Opasniy will give you new expression about Kamchatka. 80 metrs of water fall down in narrow rock canyon of river. And after we will relax in wild nature - hot spring will give our body garmony and pleasure. At the end of day we will come back in comfortable camp with room for 1-2 person. Day 4. Rafting and wild fishing. Visiting tasty place of Kamchatka. Rafting at Bustraya river. 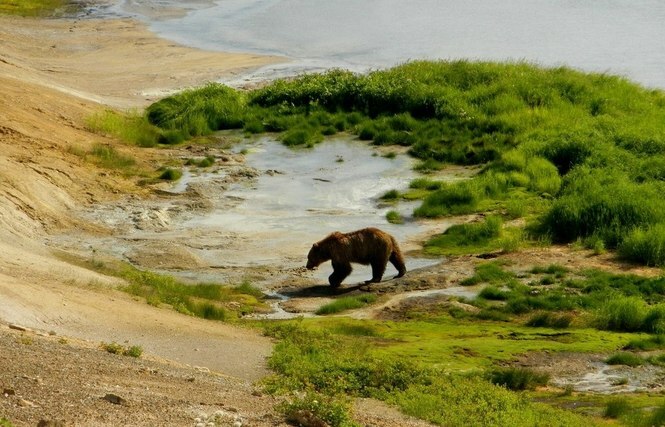 You can only enjoy new landscapes, observe birds and animals, and also spawn Kamchatka salmon fishes. Here, to spawn, come up to 40 thousand chinooks, about 300 thousand red salmons, 20 million pink salmons, and also coho salmon and other fish. You can choose only one place where you want to go by helicopter. We spend 2 days for this excursion, because it depends about weather. But if you want both of them - you can order it for additional price. Place 1. Valley of geysers. The only geyser field in the whole of Eurasia, the second in terms of the number of geysers in the world. It is represented by a deep canyon, along the gorge of which the Geysernaya River flows slowly. The sides of the gorge contain the outcrops of hot water, mud, steam, as well as numerous gushing springs. Throughout the excursions you can meet a variety of animals: from a brown bear to a cunning red fox. Place 2. Kuril lake. Every year in summer, in August, the brown masters of these places hasten to come here first, because here is located one of the largest spawning grounds of Kamchatka salmonids . Hundreds of bear individuals converge at this time to a feast. However, all of them are under the protection of the reserve. 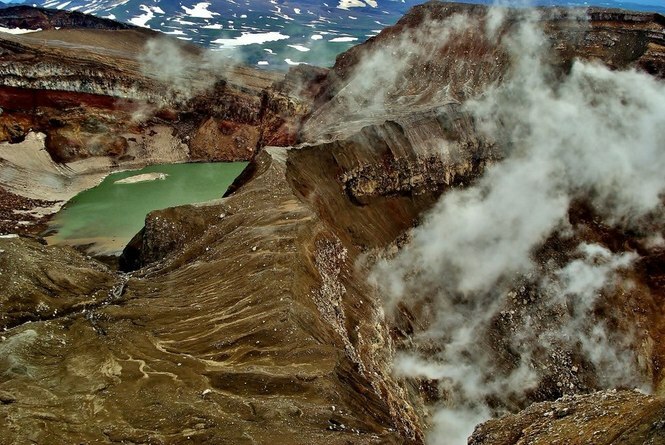 In addition to excursion after visiting the Kuril Lake, during the flight by helicopter we are surrounded by the volcanoes Karymsky and the Small Semyachik, and can to see the caldera of the Ksudach volcano and bathing in the Hotodskinskie hot springs. Day 7-8. Discover landscapes of Mars. The first day we will have trip to center of Kamchatka peninsula and after exiting off-road trip to Tolbachik. After a few time for relax all group move to see lava's cave after exposion of 2012-2013 years and feel still hot breath of land and eating roasted food. Lava formed various beautiful shapes, many slag cones around, moon-like sceneries. Next day, we arrive in the "Dead Forest" - area, which was destroyed by Tolbachik volcano eruption in 1975. Thousands of trees were killed instantly by the volcanic ash cloud having a temperature of more than 1000 degrees centigrade. After hiking to sopka Gorshkova (altitude - 330 metrs) is one of hill where was Great Fissure Tolbachik eruption. Here we will find place where still now you can set fire from landscapes. In this area scientists hade testing of Mars rover. Accommodation: 1 - base camp in tent, 2 - cozy wooden house in Kozyrevsk. Day 9 - 10. Deep inside etnic culture of Kamchatka. Transfer to the settlement of Esso, home to the Evens, one of the 4 indigenous peoples of Kamchatka. Here you'll stay in the hotel with a thermal pool, where you can relax after several days in the wild. At this day we will visit museum and etnic village of locals, introduce with cultural caremonies and food. Day 11. Sailing day at Pacific ocean. 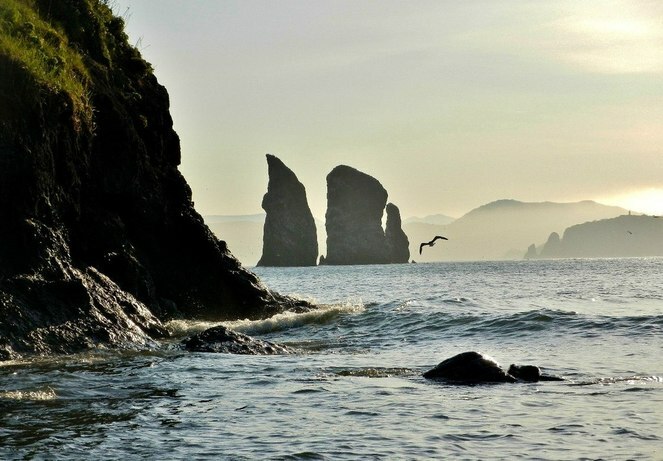 We leave Petropavlovsk sea port early in the morning to embark on a marine adventure in Russkaya Bay. 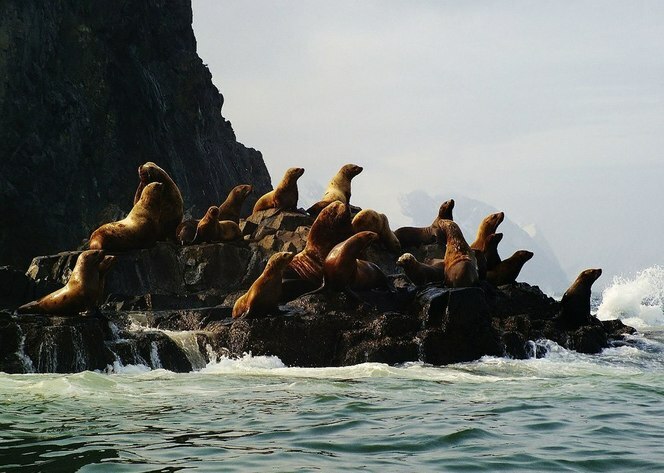 Try your skills in sea fishing and enjoy the marine wildlife watching: orca whales, sea lions and otters. Day 12. Come back day.